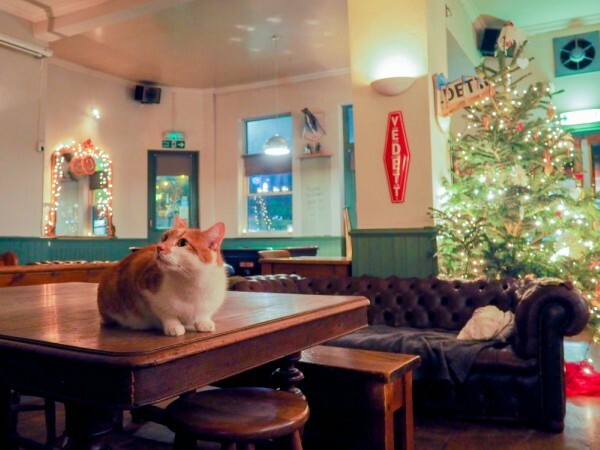 The Charlotte Despard in Archway is one of the coziest pubs in London. 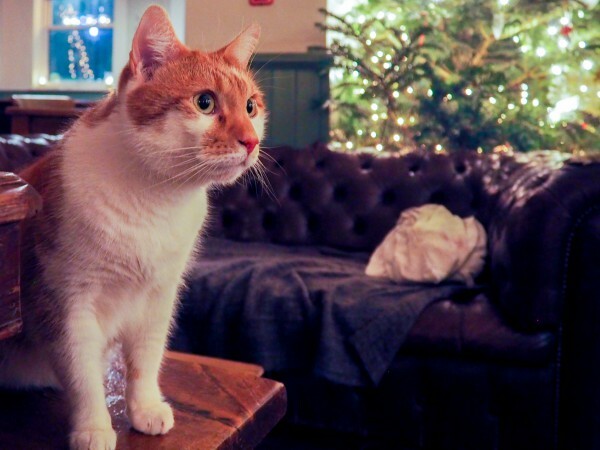 Lots of candles, warm lighting, comfortable furniture, local beers, and...a cat named Legz. Legz arrived at Charlotte Despard nearly six years ago. 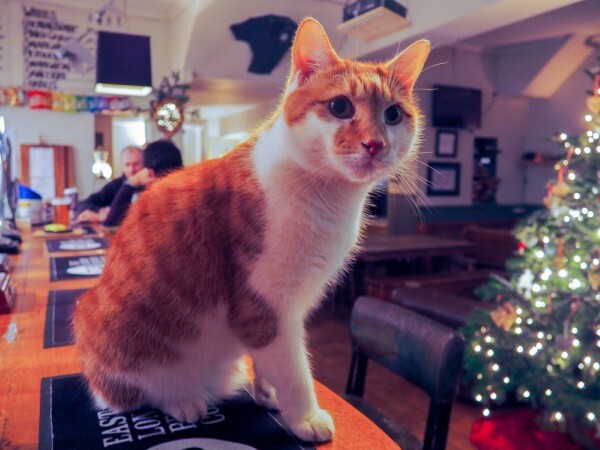 Chris Sparks, one of the pub's owners, saw a video of Legz when was recovering from an injury after being hit by a car, and it was love at first sight. He went to the shelter to meet him, and the rest is history. Legz is a three-legged cat, but you will hardly notice he's missing a limb. He's extremely agile, races from one corner of the pub to the other, and constantly jumps on and off the counter and the tables. Only once in a while, you will see him limping a little, but only if you pay close attention. He's very sociable but doesn't seem to like it when the initiative comes from customers he's not familiar with. But don't worry...Legz will be with you in no time, looking for attention and headbutts. Sometimes, the pub owners will present Legz with three glasses of beer, and the one he chooses is discounted for the night. 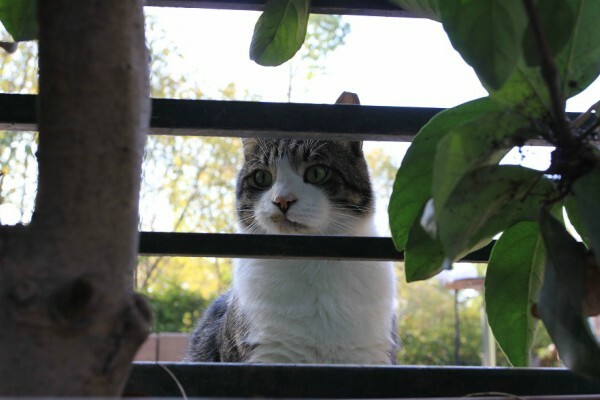 Legz has been featured in the book Pubcats of London, in a Japanese cat book, as well as in several local newspapers. 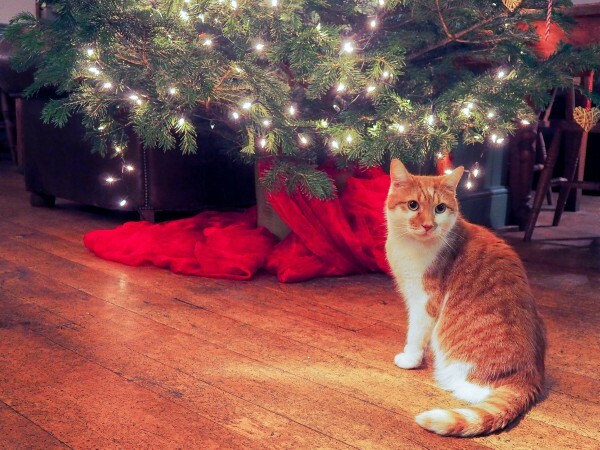 He was also named UK Cat of the Year in the National Cat Awards 2014. 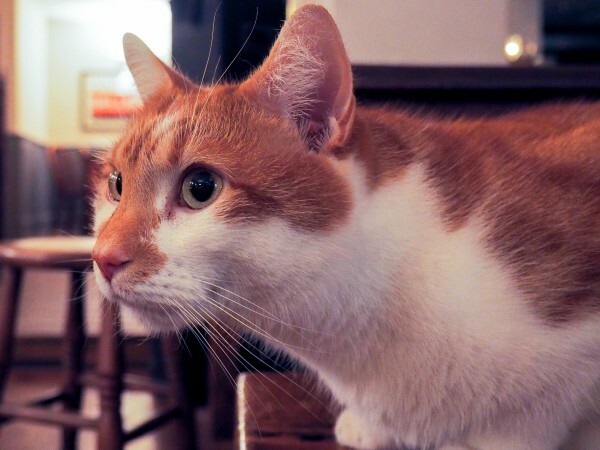 Thanks to his notoriety, many customers now show up at the Charlotte Despard to meet him and bring him treats and toys. 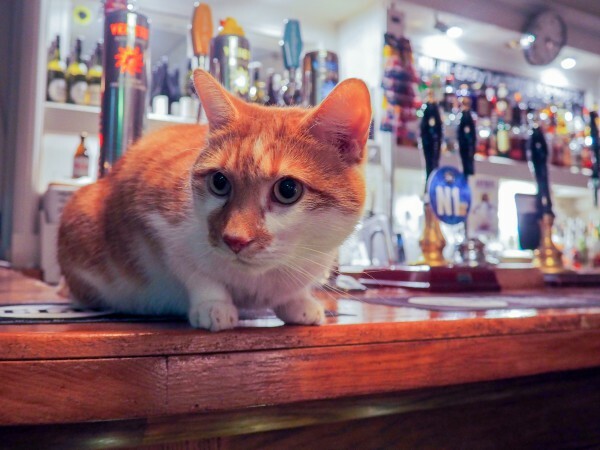 He has inspired many pubgoers to adopt a rescue cat of their own. Do you want to meet Legz? The Charlotte Despard is open from Monday to Saturday from 5 pm to 1 am and on Sunday between 5 pm and 12 am. 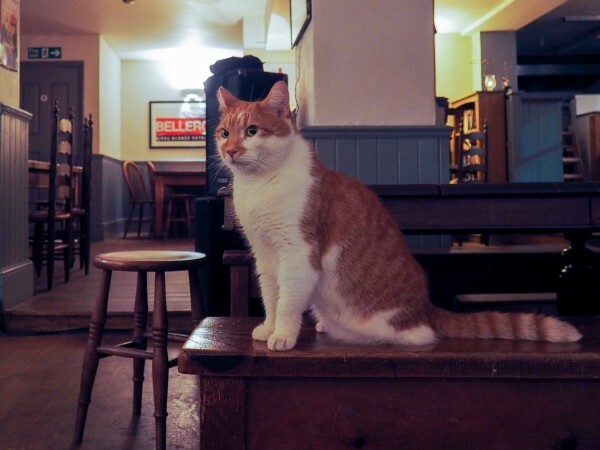 By the way, the pub is situated close to Highgate Cemetery, which is teeming with cats. 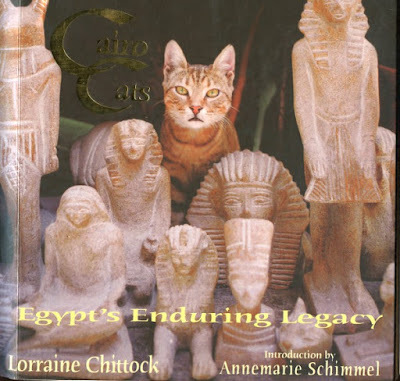 Wanderlust and a sense of professional adventure took Lorraine Chittock to Cairo in 1991 to work as a magazine photographer. Her fascination with the camel trade culminated in the coffee-table book, Shadows in the Sand: Following the Forty Days Road, an account of her arduous trek along an ancient caravan route from Sudan into Egypt. 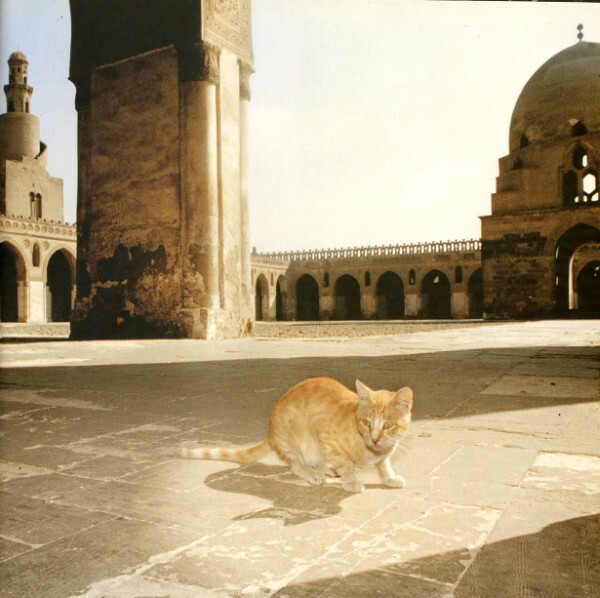 Cairo Cats looks at another creature which is as intrinsic a part of Egyptian culture as the camel. 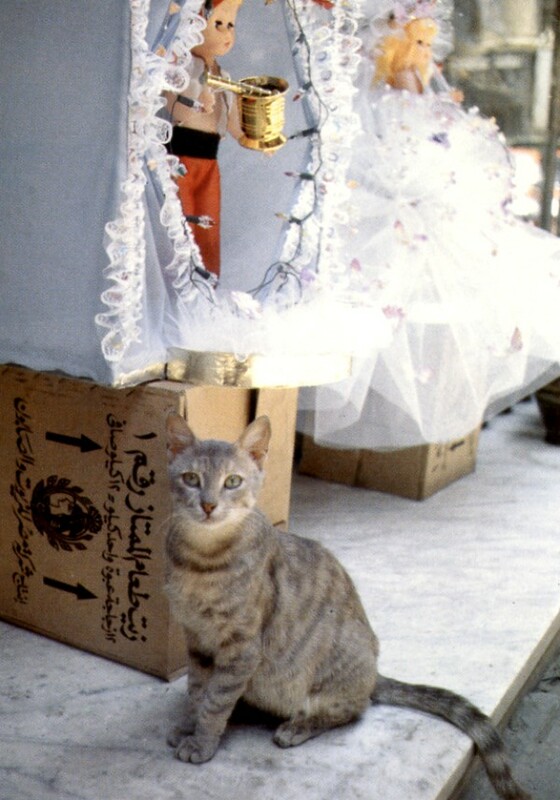 During her seven years in Cairo, she explored the nooks and crannies where the feline denizens of the city hide in order to obtain her intimate portraits of these wary inhabitants. Near Sharia 'Abu 'Alam, Bab al-Louk. Mish-Mish on the banks of the Nile River, Zamalek. 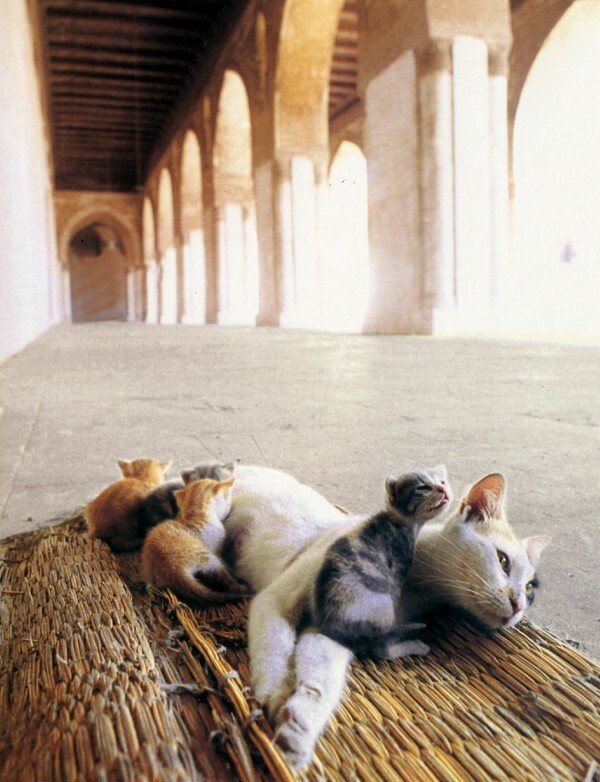 In the mosque of Ibn Tulun. 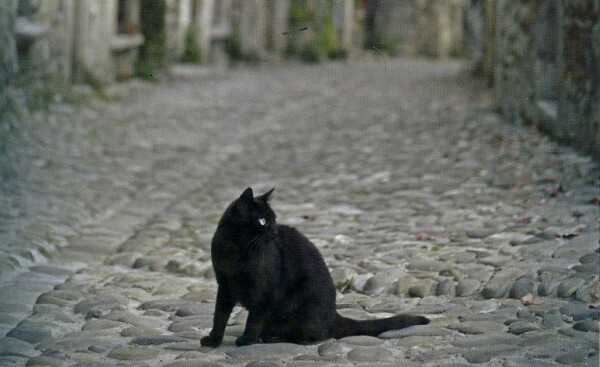 These cats occupy one of the most beautiful villages in France: Pérouges. Most of them have owners who treat them like treasured, indulged pets. 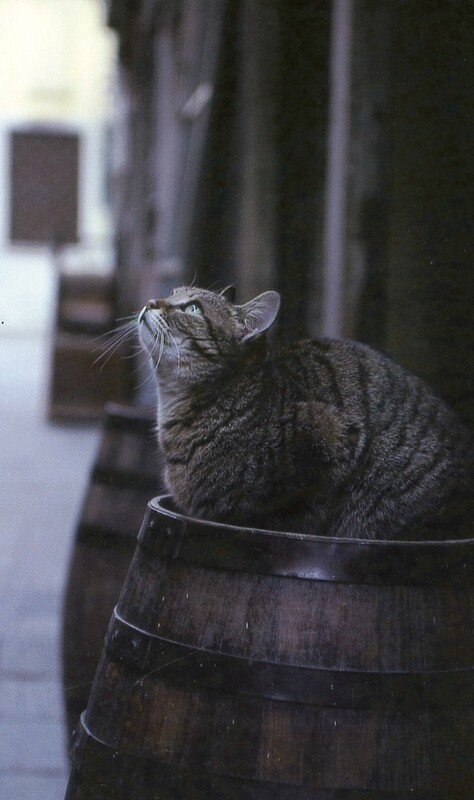 But like in nearly every village, there's a pack of "gutter cats" too. 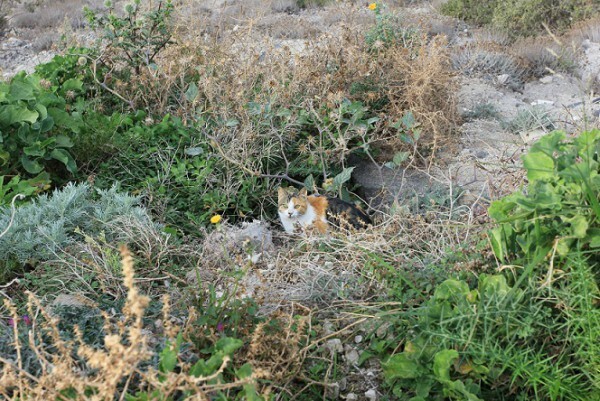 Some are unwanted strays; others' owners have died or moved away. Regardless, there's always someone who feeds and looks after them. Venice regains its natural rhythms in the winter when the sightseers have departed and the residents can move throughout their city unhindered by tourists. 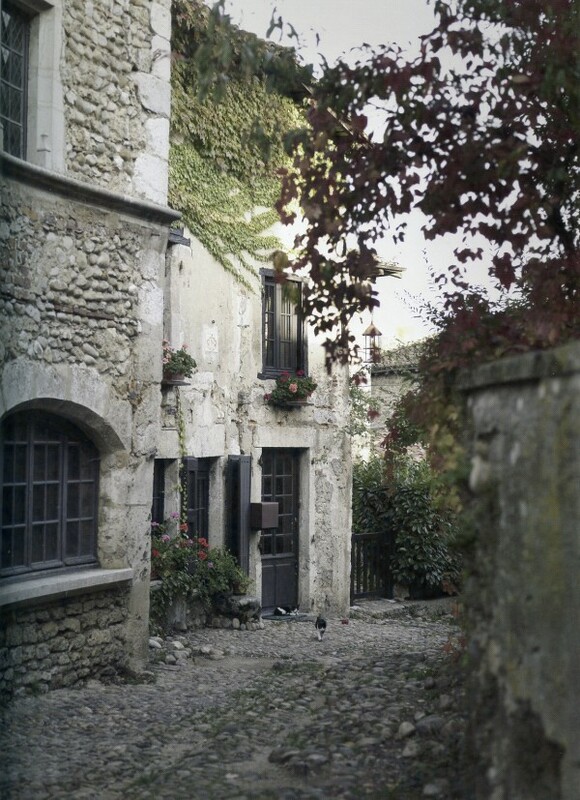 In the spring, I abandoned the well-trodden paths and was able to sense the quiet life of the local people. 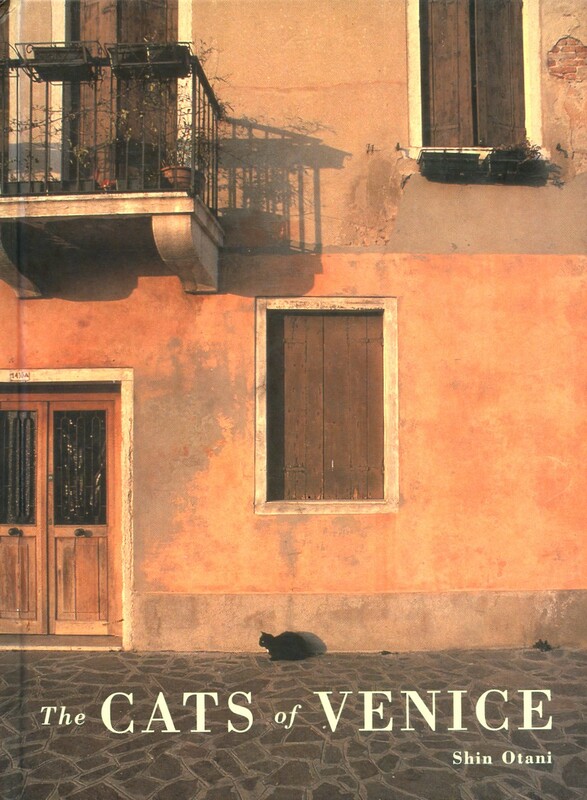 One afternoon, I came upon a woman feeding stray cats in a park. When I approached and took her picture, she became visibly upset. I tried to get her approval, but she would not say anything. To avoid upsetting her, I joined a child who was watching as the woman fed her cats. Each cat received a portion of the meal: ground meat mixed with pasta. When the cats finished, she cleaned up and handed dry food to the cats that still looked unsatisfied. As I left, I said good-bye and she finally smiled. 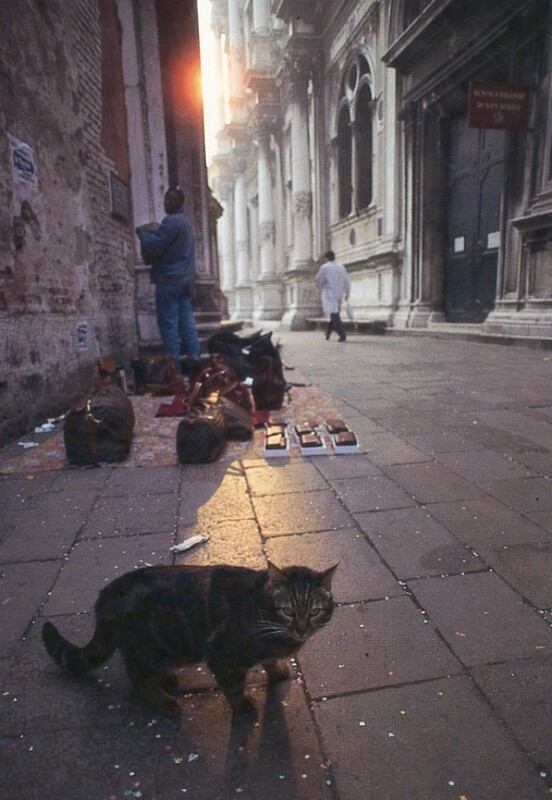 Another morning, I ran into a man feeding stray cats in a plaza next to a canal. In my poor Italian, I asked permission to snap some photos. He grudgingly said okay, but seemed suspicious: why would this strange tourist want to take his picture. 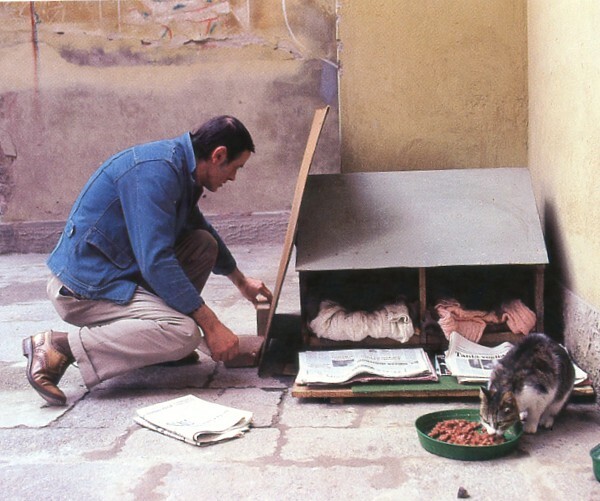 I, of course, could not converse with him in Italian, but I wanted to photograph him feeding the cats. I did not see him again even though I returned to the same plaza a few days later. 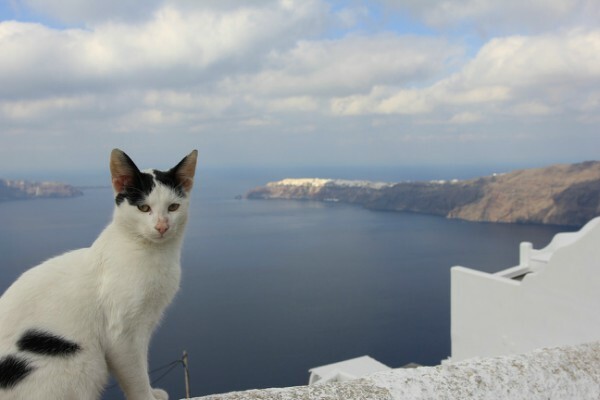 You may have recently seen my post about cats on the island of Santorini in Greece. Santorini was the first stop in a two destination trip to Greece. Athens was next in line! 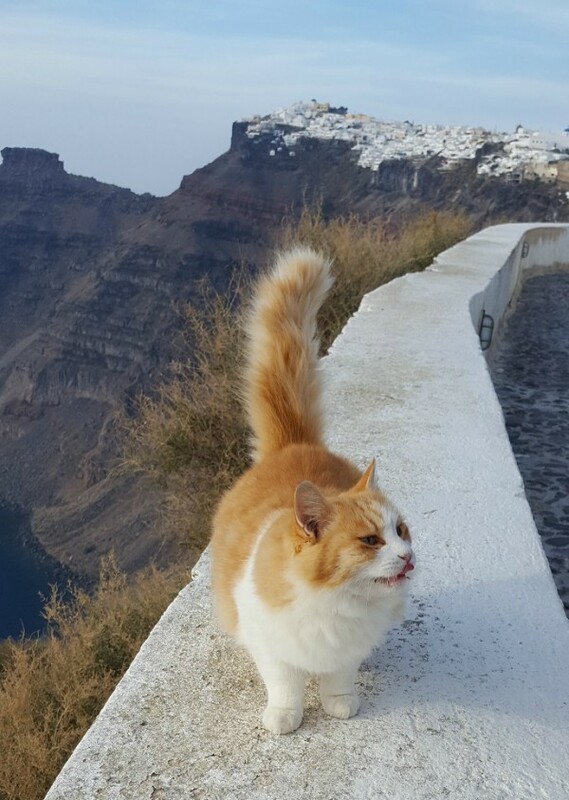 While I was pleasantly surprised by the number of cats I encountered on Santorini, I actually assumed it would be limited to the island. 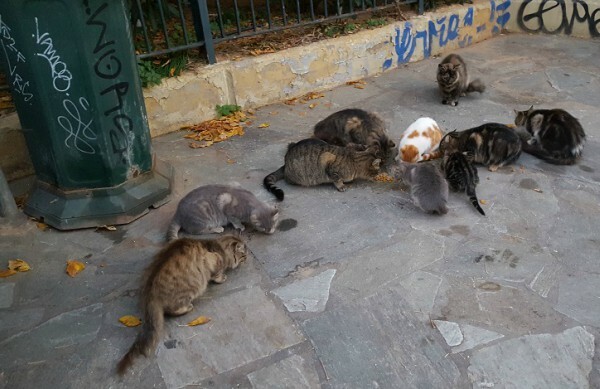 I didn’t think a city the size of Athens would have nearly as many cats around due to the number of people and the lack of parks and fields. Little did I know I was in for another big surprise! 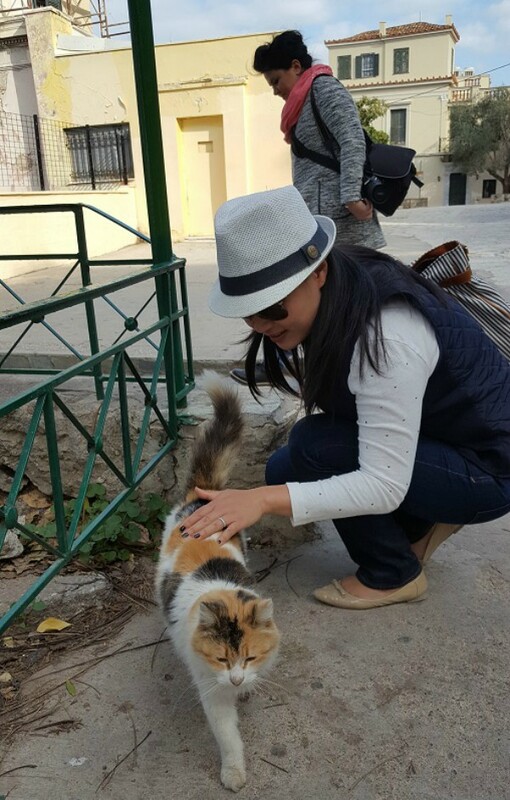 There were cats all over in Athens. You could certainly say the city was cat crazy! In a good way though, at least I certainly thought so. We stayed right in the center of Athens near the Acropolis. 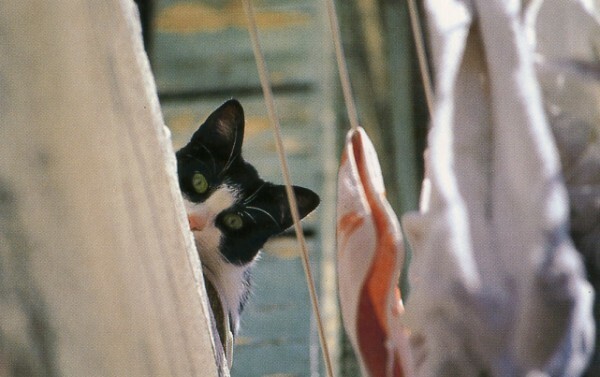 The first morning, we looked out through our hotel window and found this little guy staring right back at us. He didn’t seem even slightly worried about our presence. If anything, he seemed to be asking "Where is the food I so desire, my human friends?" If you’re planning to go to Athens, or you’ve talked to anyone that’s been there, you’ll know that the one thing you simply can’t miss is the Acropolis. It is iconic, placed at the very top of the city. You really cannot miss it even if you want to. 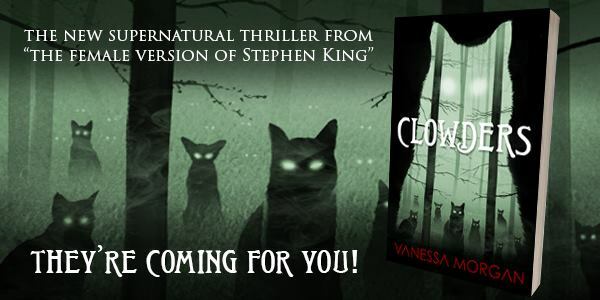 And apparently, this isn’t lost of the feline population either. 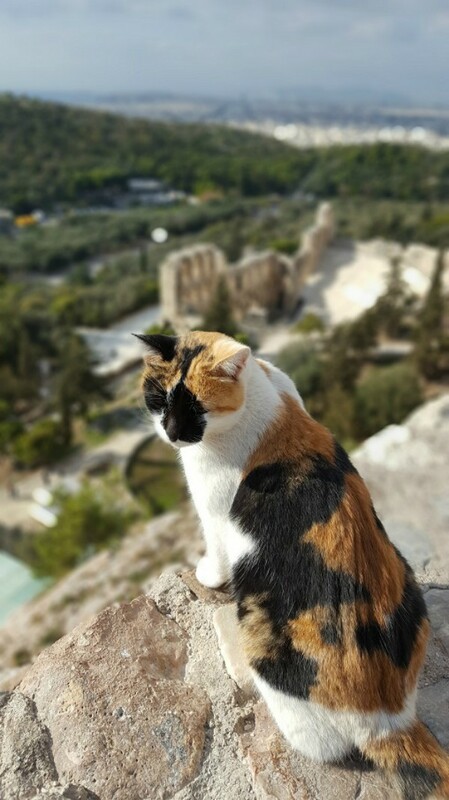 The beautiful young lady from the top picture was hanging out right next to the Acropolis and watching down over the city. I assume she is the God of Cats and is simply looking down on all the humans that are her subjects. 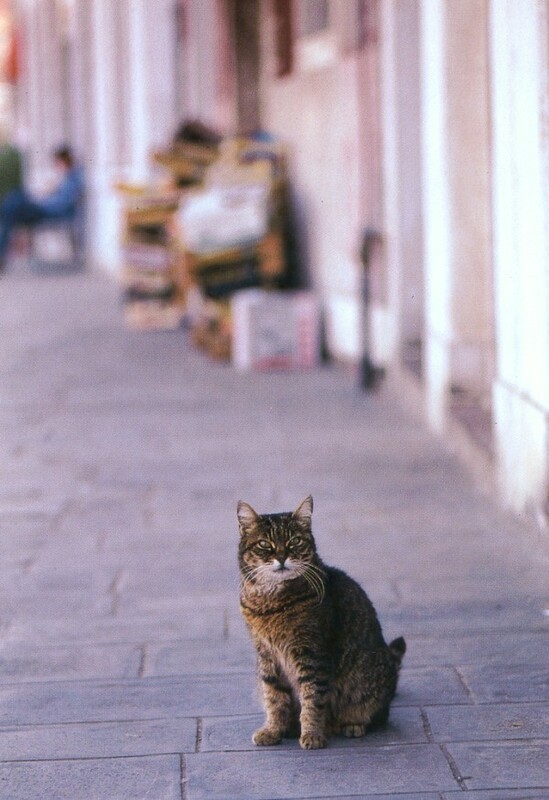 As we continued through the city, we encountered numerous other cats. Our next major destination was the old Agora east of the Acropolis. 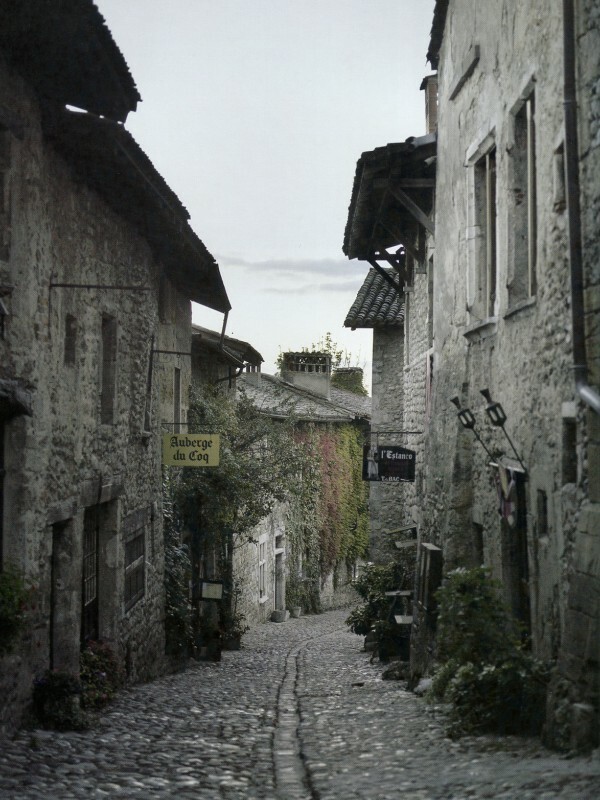 There are still remnants of the marketplace, bases of buildings, stairs, bridges. They are scattered throughout what is now a cultural heritage site. A few of the buildings have been completely restored to their original state and have tons of amazing artifacts inside. You could easily spend hours there! On the way there we encountered this gigantic fluff ball roaming the sidewalks between houses. Friendly as can be, she wanted nothing but pets and meowed up a storm! Our next major destination was the Temple of Zeus the next morning, so we decided to head for home. Athens is a very walkable city so we meandered through the side streets instead of grabbing a cab. Little did we know we’d have the luck to meet up with a small colony of outdoor cats that were clearly well taken care of by numerous members of the neighborhood. All of the felines were congregating in one spot before someone even showed up to feed them! We had stopped to consult our map briefly and watch the cats. Then a car arrived. I thought it was just parking at first until they opened the trunk up and put numerous bowls of food out for the cats. The purr storm started pretty much immediately as they got both pets and dinner. The next morning, we were off toward the Temple of Zeus bright and early. Little did we know that we’d end up at the wrong entrance and instead find a mother cat that had clearly given birth in the past few weeks. 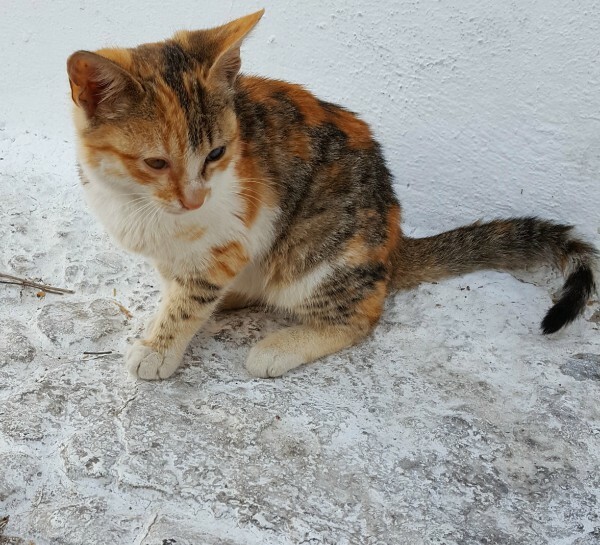 She had a litter of at least three running around causing havoc and showing no remorse when accidentally clawing or biting the silly tourists that decided to say hello! While I would have preferred not to be used as a chew toy I managed to limp onward. We shortly figured out where the entrance was, and we moved along the side of the park toward it. Arriving at the entrance, we were greeted by this little lady. 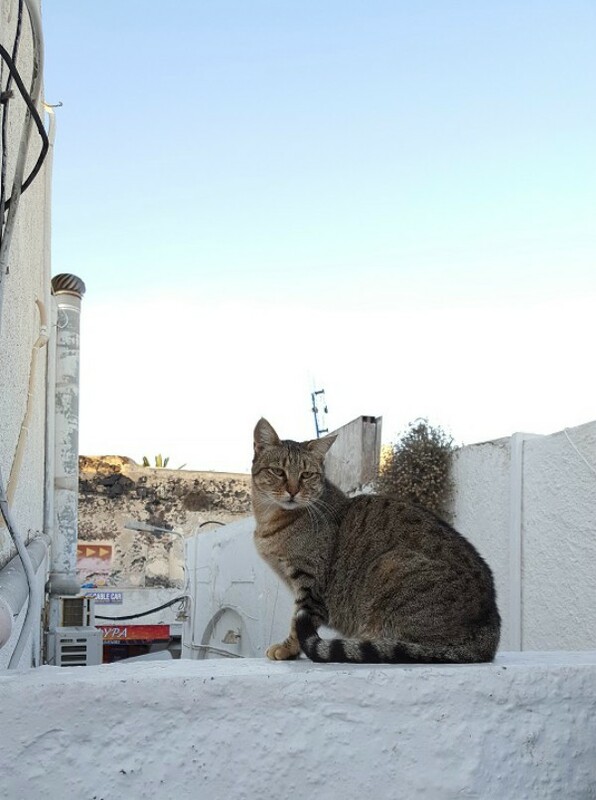 According to the guard, she was the “guard cat” and was there pretty much every single day watching over the entrance to ensure no degenerates or thieves might be around. 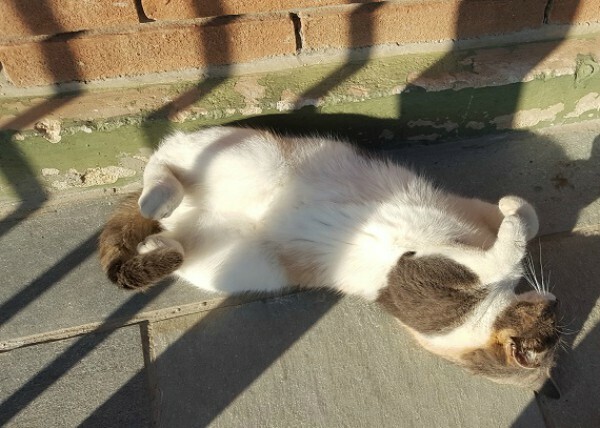 She was determined to be paid in belly scratches and loved showing off her tummy to anyone that would come near her. As you can see she was quite shameless in her drive to get those belly scratches, and it wasn’t a “human trap” as it often is. After the Temple of Zeus, we wandered the streets through the shopping and restaurant areas. Athens is a beautiful city, loaded with history and with brand-new buildings interspersed between the old. A lot of the city streets are thin and difficult to manage in a regular car. Motorcycles and mopeds make up a huge part of the traffic. And while humans are responsible for most of them, we did find this little lady getting ready to go for a ride. She was just digging out her keys as we walked past, and she gave us a good meowing. We couldn’t take her up on her offer for a ride because we had places to be. 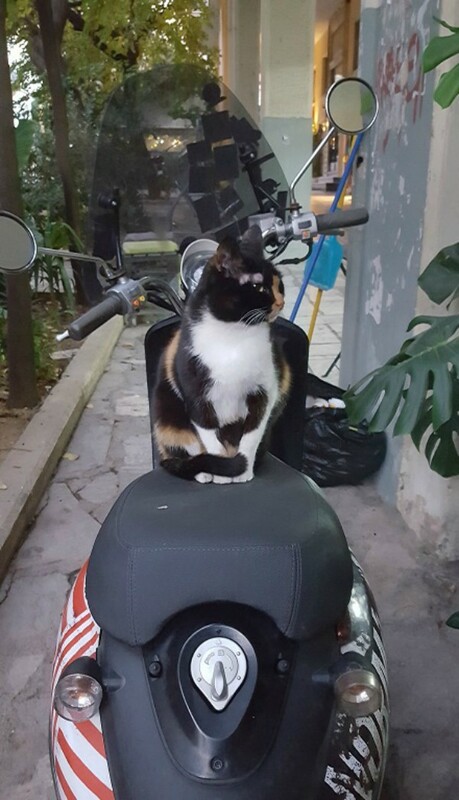 And let’s be honest, who would trust a cat to drive a moped safely in a city full of crazy humans? They might get easily distracted by a mouse or a rat running across the street. Speaking of which, on the final walk back to our hotel one evening we decided to take in the Acropolis one more time. It is actually a very long walk to circle it given how gigantic the plateau it is placed on is. While circling it around dusk and watching the lights flip on, we were quite surprised to see another rare event. 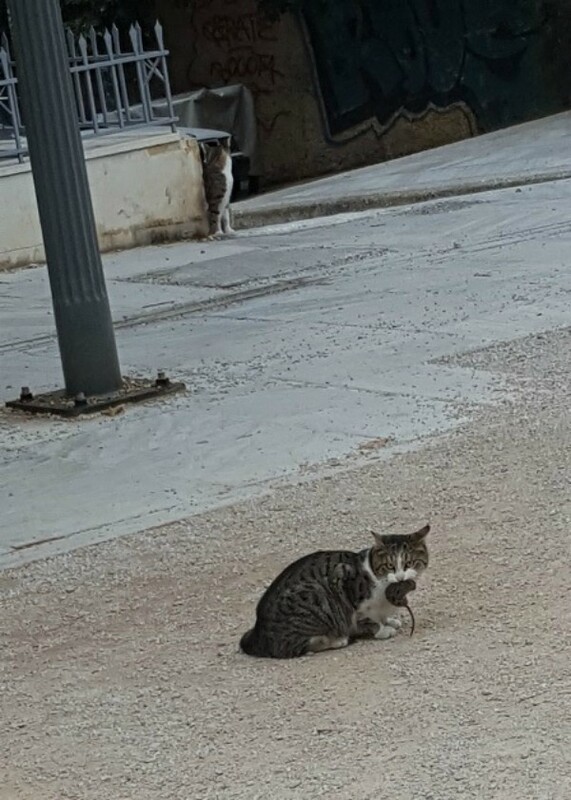 We actually managed to take in a cat capturing a mouse right at the foot of the Acropolis. As you can see, she has absolutely no intention of sharing, not that we really wanted any of it anyway. But she could have at least offered, right? If you look closely, you’ll see her friend hiding in the back of the picture waiting to partake. So off we went to find our own dinner and then make our way home from Greece the next morning. 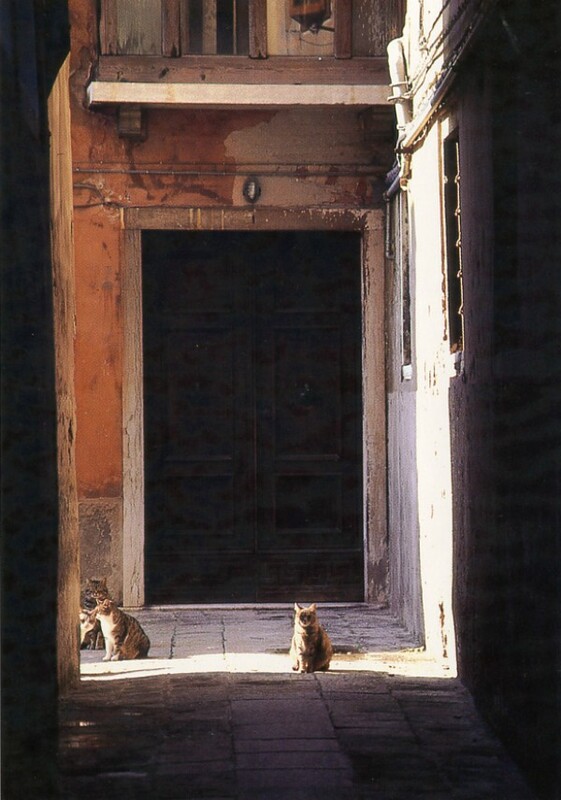 Athens was a beautiful city and made even more so by the number of felines roaming its streets and sidewalks. If you love visiting cities that have both a bit of modern and a bit of history then you definitely need to make it to Athens. 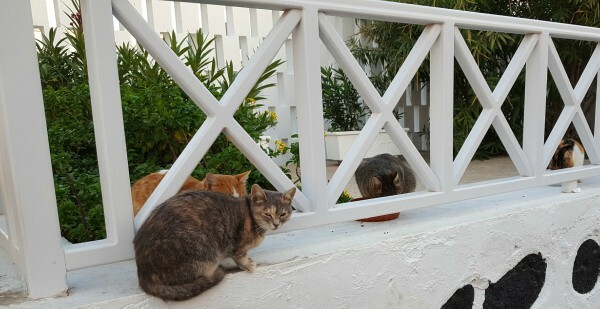 On top of that, if you like cats and want to fit some of them into your vacation, you’re in even better luck; we pretty much saw them at every twist and turn. Craig is the founder and author of the cat blog StuffCatsWant.com. 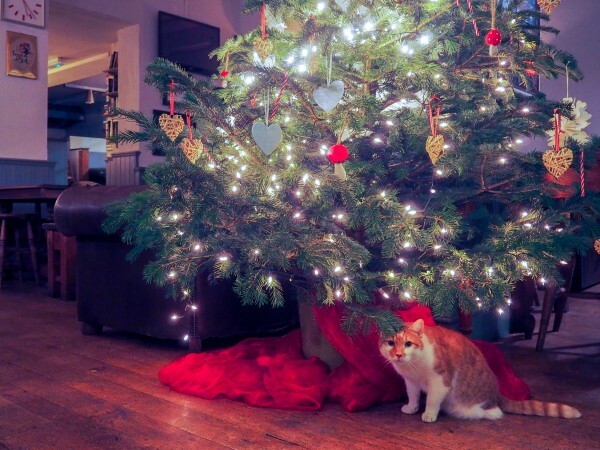 StuffCatsWant is dedicated to providing high-quality product reviews about all sorts of cat products and providing advice on general cat care. Craig has owned numerous cats, fostered even more cats and is a long time volunteer at PAWS Chicago. A little while back, my wife and I decided to go on a relatively short-notice trip to Santorini in the offseason. We were there in November, and many shops were closed, and there were very few tourists which may have contributed to this experience. Despite the fact most had no specific owner, they are clearly in good health. Many of them are very friendly and love being petted. While they live outside, they mostly eat food and water supplied by humans. 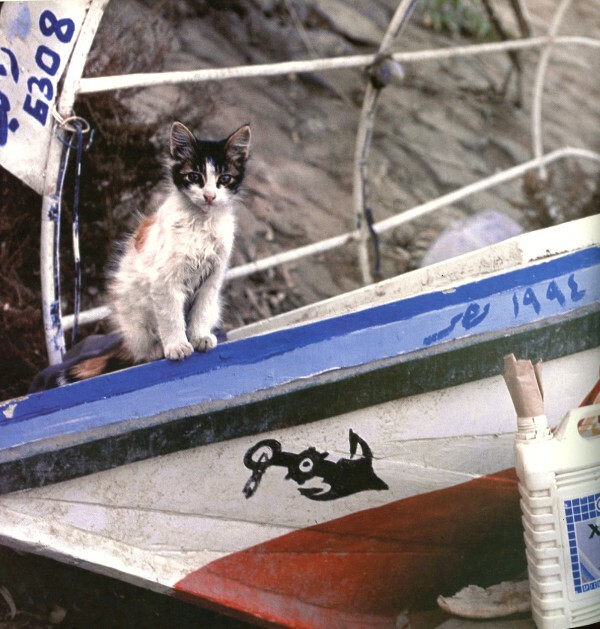 The population of Greece loves and embraces their outdoor cat companions. We arrived in the dark and went straight to our hotel, so we didn’t run into any cats the first evening. 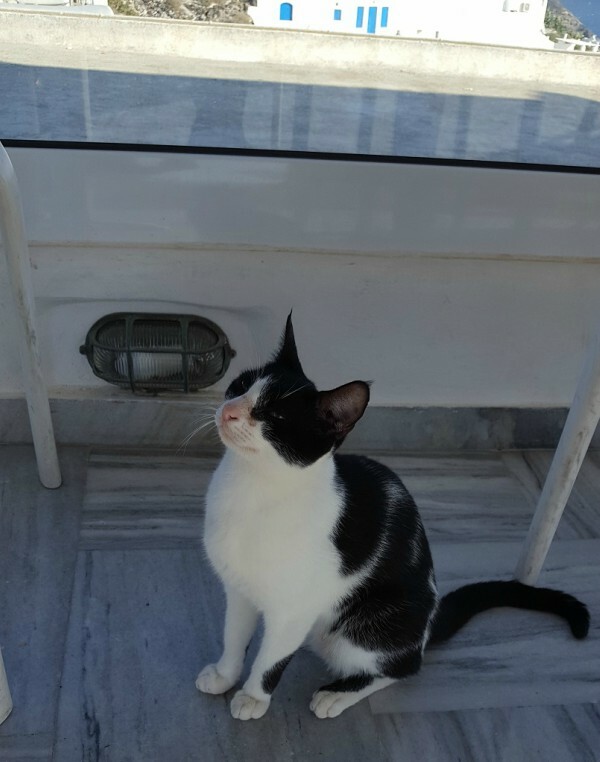 But the second morning, we took our first walk and ran into our first cat. Not to mention his buddy watching him partake in a delicious breakfast of dry cat food. At first, I thought it was just a one-off. 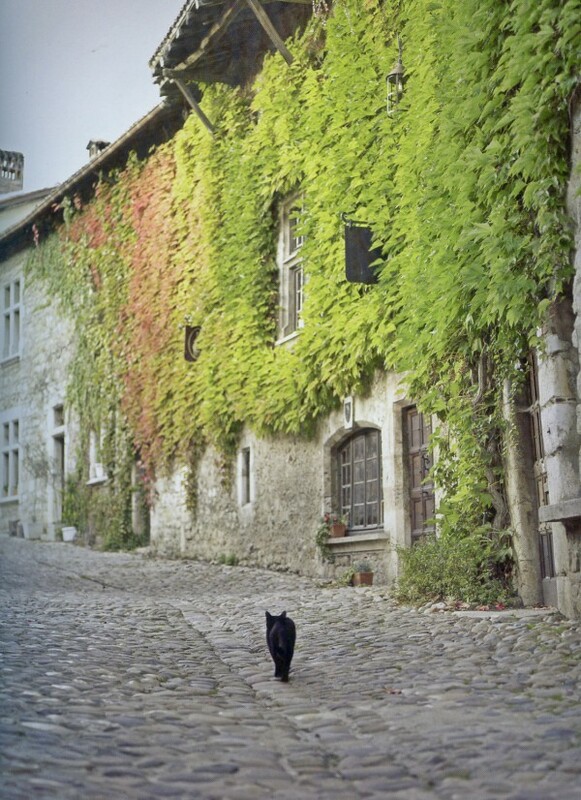 Perhaps an outdoor cat that got to wander. Little did I know that he was the first of many a cat sighting we were about to experience. 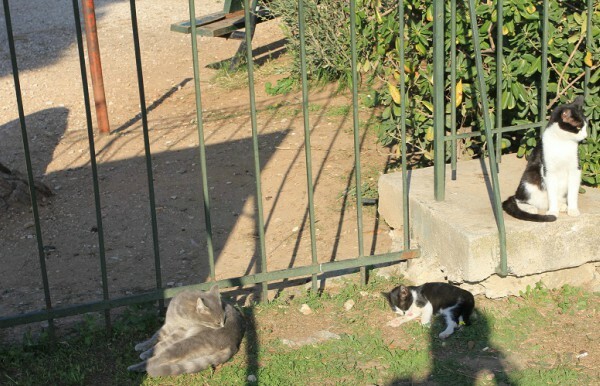 As we continued on, we ran into cats large and small. We encountered this little guy a few steps down the road. Then even more of his pals on the way back from our first trip into town. 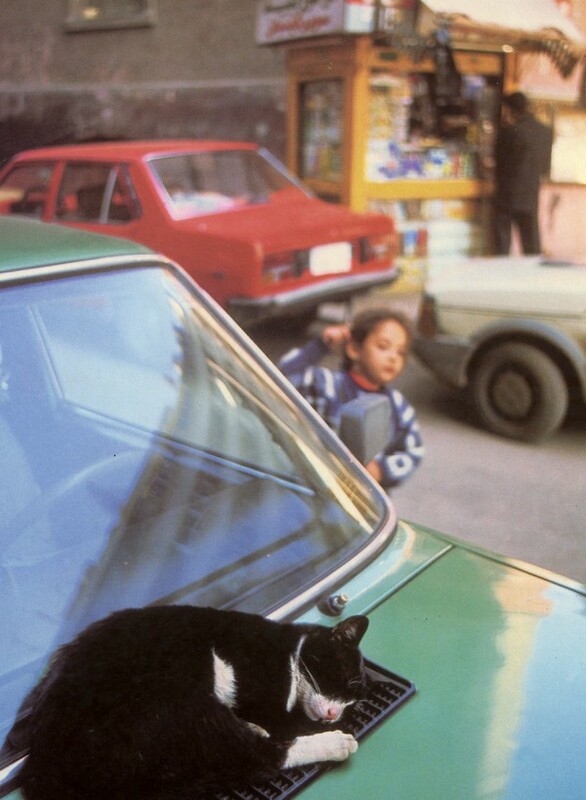 There were feline friends all over the place. And this was just on our first trip out. The next morning, we decided to hike from the town of Fira to the northern side of the island to watch the sunset in Oia. Not only was the sunset beautiful, but along the way, we managed to find a boatload of breathtaking views. And with cats enjoying them to boot. These felines weren’t just looking out the window from their beds. Despite the fact it was offseason, it happened to be a blazing hot day. The sun was out without a cloud in the sky. We stepped off the overlook path for a few moments to find a bottle of water and ran into this friendly little lady who wanted ear scratches forever; she did not want us to leave to say the least. But we had a long hike ahead of us if we wanted to make it all the way to Oia before the sunset. So, on we traveled. That is until we found this fine fellow looking like he might charge us a toll for taking in the view he had. And just below him on the cliffs, he had a friend hiding in the bushes. This little calico lady (I’m guessing it is a lady based on statistic) was too shy to come out and see us, but she was gorgeous even from afar. 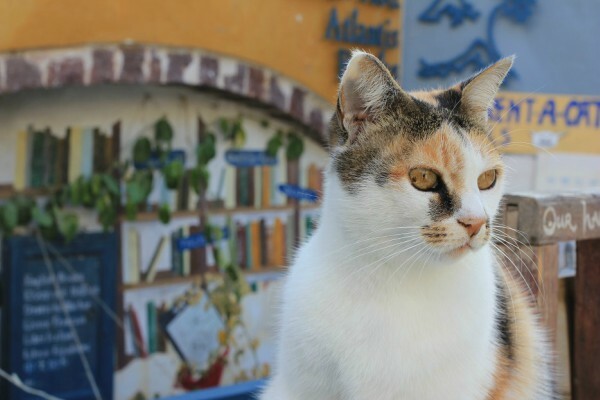 As we reached our destination of Oia, we quickly discovered that this little town was equally as interested in providing a friendly and healthy environment for their feline friends! We were immediately greeted by a Rent a Cat sign. 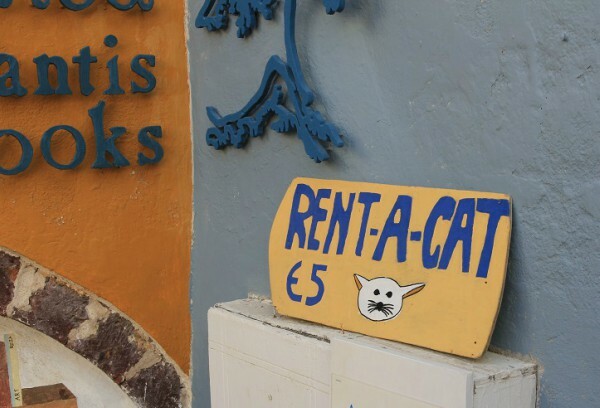 And while I did actually inquire about whether or not you could rent a cat, I was told the sign was merely a joke given the number of cats that frequented the area. Quite a bummer if I do say so myself. 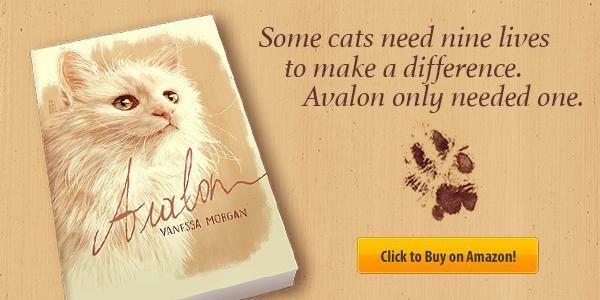 I would have gone for an extra fluffy version with extra loud purring given the opportunity. That being said, the sign was outside one of the most famous bookstores on the island. This fine looking lady was keeping an eye out for any potential thieves or intruders, but she seemed to have a pretty light day given the offseason traffic was at an all-time low. Before we closed up shop for the evening and headed back to Fira, we decided we’d stop and get some lunch at a local restaurant. 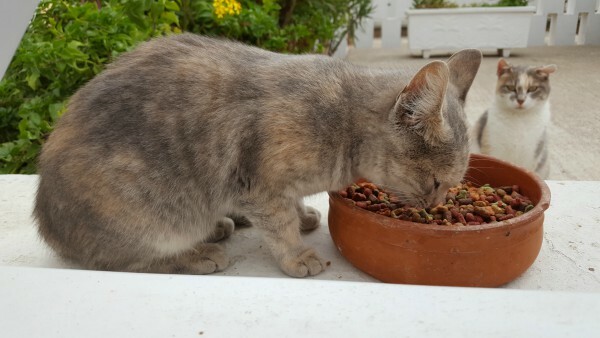 Despite being on, or maybe because we were on a rooftop, there were a healthy number of cats wandering the restaurant. It was obvious one was a frequent “patron,” you could say. He knew to pounce on the plates for food before the cleaning staff could make it to the table. He also knew to meow under the table where people had french fries, I’m thinking he just has good taste myself! The hike we did took up about four hours for just one direction and after lunch, we wanted to stick around for dinner to watch the sun set into the horizon. We found a beautiful west-facing bar overlooking the water and took it easy and had a few drinks. After watching the sunset, we decided to take a taxi back to Fira instead of attempting a hike in the dark in a place we weren’t familiar with. 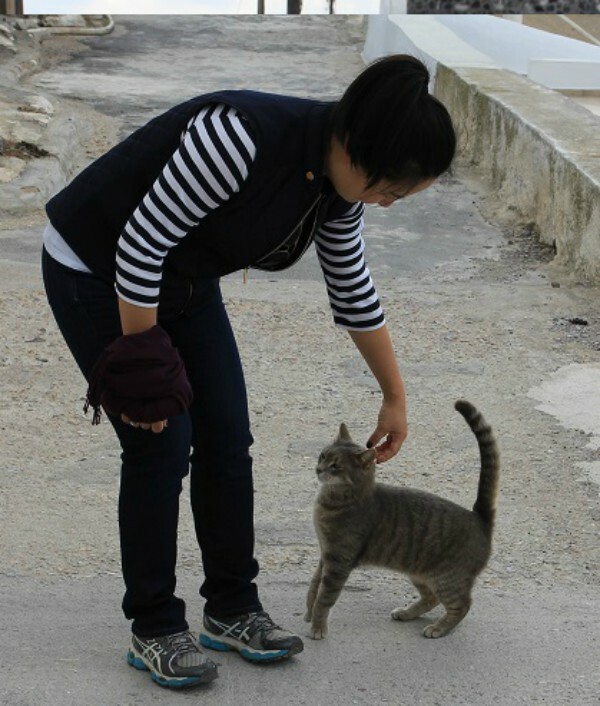 The rest of our time on the island was filled with numerous cat encounters of all kinds. Young, old, fat, skinny, big, little. You name it, we saw it. 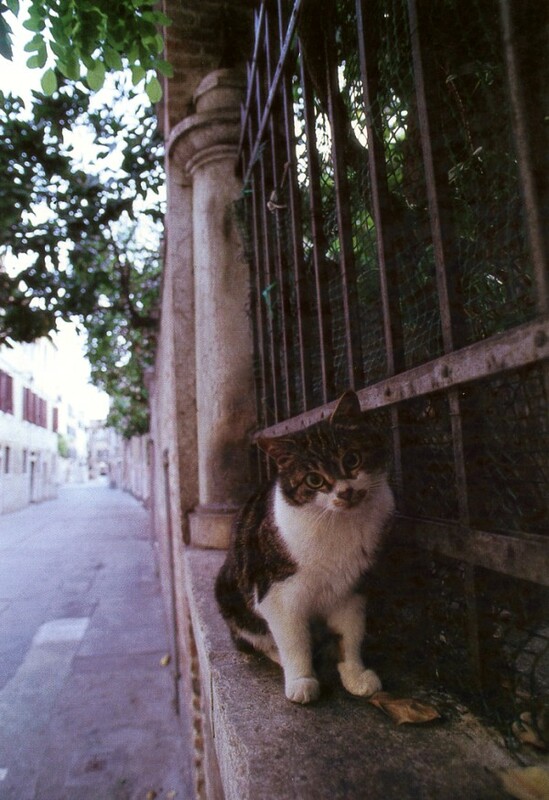 This fine feline graced the presence of a wall outside the hotel we were staying at and meowed a good morning to us. But the last cat we saw as we went to get into our taxi and head to the airport was this fine black feline. 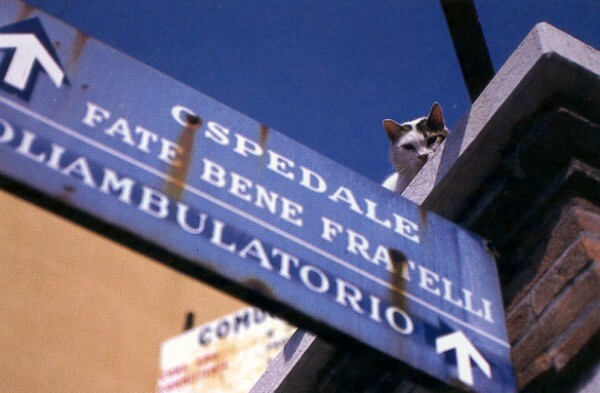 Not only did this cat know the view was amazing, he also seemed to know his contrast with the largely white and colorful buildings around him made for a great picture. He stayed still and let me shoot photo after photo just drinking it in. Santorini itself was beautiful, and I would love to go back during a busier season when more of the shops are open and the island is busier, but I think we got a rare treat going in the offseason. 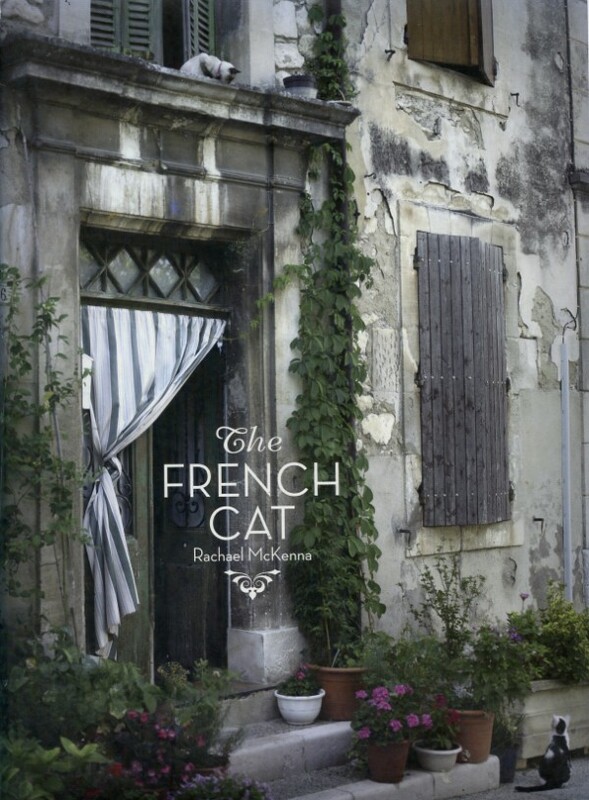 I’m not certain if we would have seen nearly as many cats, or if they would have been as out and about as they were given the limited number of people around. 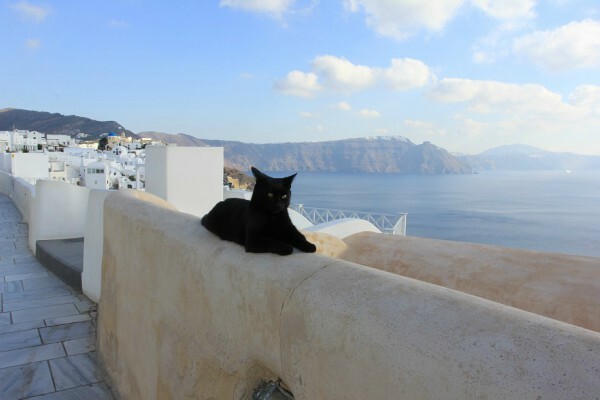 If you’re looking to plan a vacation that's loaded with cats and has a scenic outdoorsy landscape, then I would highly recommend a visit to Santorini. 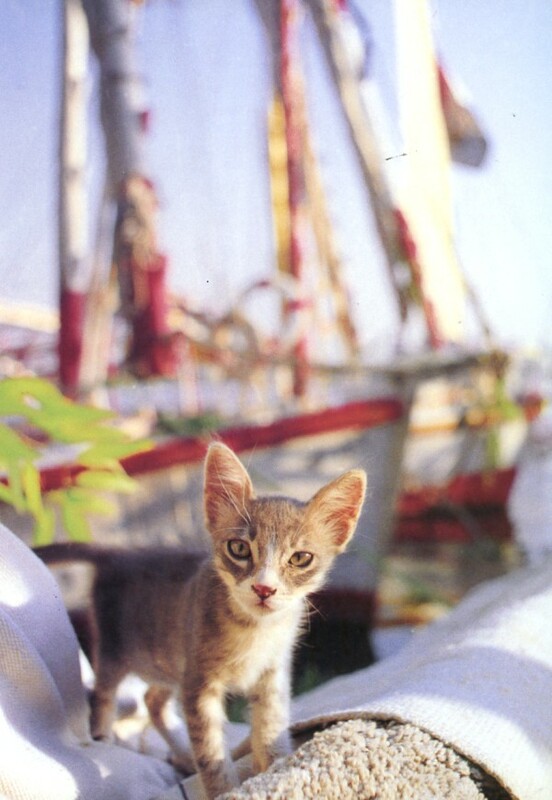 Even you don’t happen to experience the cats due to the busy season, you’ll have an amazing time with everything else available on the island.